Week Three of the Texas Beef Council’s Spring Campaign couldn’t have come at a better time. 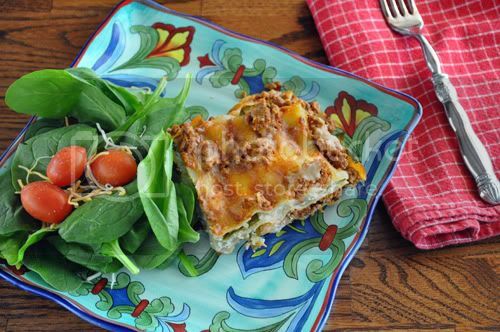 Featuring ‘Healthy Family Favorites’, this ‘Beef, Arugula & Spinach Lasagna’ is a wonderful (and nutritious!) comfort food. C has been traveling for work the past two weeks and I’ve been a bit down, so this dinner definitely warmed me up and lifted my spirits. 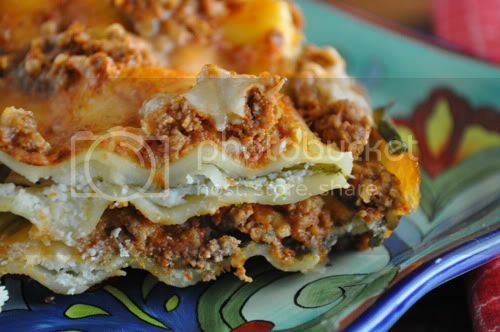 It’s filled with lean, ground Texas Beef, cheeses, spices and those all important greens! Spend about an hour in your kitchen preparing this weeknight dish, serve with a bright salad and you’ll have some happy campers on your hands! For a round-up of this week’s posts from my fellow Beef Loving Bloggers, click over to Holly’s blog, June Cleaver Nirvana. She’s also got some helpful hints and ideas using the USDA My Plate guide! Heat oven to 375 degrees F. Brown ground beef with garlic in large nonstick skillet over medium heat 8-10 minutes, or until beef is no longer pink, breaking up into 3/4-inch crumbles. Pour off drippings; season with 3/4 tsp. salt and 1/4 tsp. pepper. Stir in pasta sauce. Set aside. Combine arugula and spinach. Set aside. Combine ricotta cheese, egg whites, basil, oregano, remaining 1/2 tsp. salt and 1/4 tsp. pepper in small bowl. Spread 1 cup meat sauce over bottom of 11-3/4" x 7-1/2" glass baking dish. 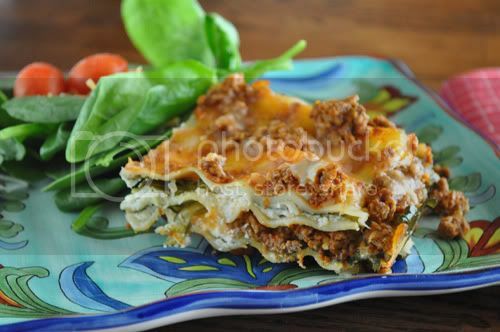 Top with 3 noodles, half of the ricotta mixture, half of the spinach mixture, 1/2 cup mozarella and 1-1/2 cups meat sauce. Repeat layers. Top with remaining 3 noodles and meat sauce. Cover with aluminum foil. Bake for 45 to 50 minutes, or until noodles are tender and sauce is bubbly. Remove foil; sprinkle with remaining 1/2 cup mozzarella. Bake uncovered 5 minutes or until cheese is melted. Let stand, loosely covered, 10 minutes before serving. Disclosure: I am participating in a four week campaign with the Texas Beef Council and am being compensated. All photography & opinions are my own. Recipes are courtesy of the Texas Beef Council.